Embed images are displayed in eZOE side-by-side, what shouldn't happen according to Object embedding documentation page. See attached bug-001.png image. With this tag, embedded objects are inserted as "block elements". Such an element always begins on a new line when it is displayed. It exists in its own virtual box and is always followed by a carriage return (like if someone hit the "Enter" key after inserting the object). This means that, for example, inserting an image using the "embed" tag will break the current paragraph. 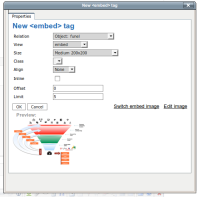 The "embed" tag is represented by block-level tags in the resulting XHTML code. In fact, if you insert an embed file object, it will be a block element not allowing anything in the same line. See attached bug-002.png image. The behavior of embed image and file elements should be the same. In eZOE, add an embed image according to attached bug-001.png image. Add a second embed image in the same line according to attached bug-001.png image. See that both images are side-by-side. Add an embed file element. See that the file won't allow anything else in the line. The issue is already fixed, the second one reported in the comment is being handled in EZP-22928. Damien Pobel (Inactive) added a comment - 26/May/14 12:22 PM The issue is already fixed, the second one reported in the comment is being handled in EZP-22928 .